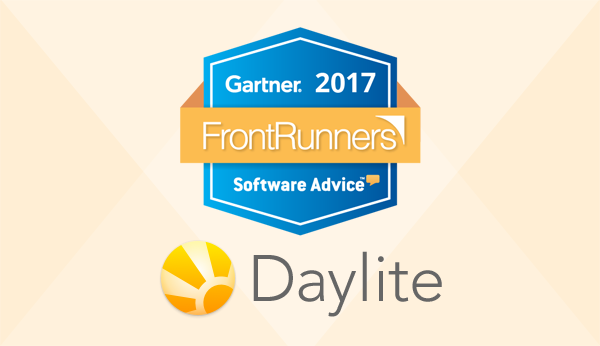 We’re excited to share the news that Daylite placed on the 2017 FrontRunners quadrant for CRM published by Software Advice. FrontRunners is a data-driven assessment of small business products based on capability and value. More than 1000 products were evaluated and only those with the top scores made the quadrant. We’re thrilled to be one of them! The scores for each product are largely based on end-user reviews, which is why it’s so important as a customer, to leave honest online reviews of products you use. Online reviews help other small businesses make better-educated decisions about which products to try based on their needs. As you know probably all too well, small businesses don’t have time to try every solution available, which is why they rely so much on reviews. Thank you to all our customers for leaving reviews! They help us gain more visibility in the small business CRM market as well as help other small businesses like you to make better buying decisions. Want to help other businesses like you when looking for the right small business CRM? Write a review here.